When making a banjo fingerboard I ask myself two questions. What kind of material will the fingerboard be made from? There are lots of options for fingerboard materials. Ebony is the traditional material of choice for fingerboards. Rosewood is a popular choice as well. There are a wide variety of other hardwoods that work well. Some synthetic materials also make for great fingerboards. The fingerboard takes a lot of wear from the fingers. That being the case, it is wise to have a fingerboard that is really durable. The durability of the fingerboard material is important to the life of the instrument. To Fret or Fret Not? The fretless fingerboard is easier to make than the fretted fingerboard. 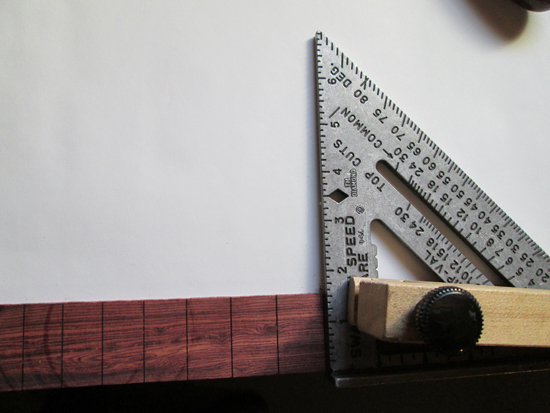 The fretted fingerboard demands some very exact measurement and cutting. The IBEX fret rule is great for laying out fret spacing. Purchasing a pre-slotted fingerboard from a luthier supply is a great way to save time and ensures the fret spacing will be correct. The money paid for them is worth it. It is so easy to make a small mistake when slotting, small enough that it may not be noticeable to the eye but will be noticeable to the ear when the instrument is strung up and played for the first time, after its too late. I’ll go over fret slotting here because it is good to know how to do it. The Ibex fret rule includes 4 different scale lengths. It is much easier to cut the fret slots before gluing the fingerboard to the neck. 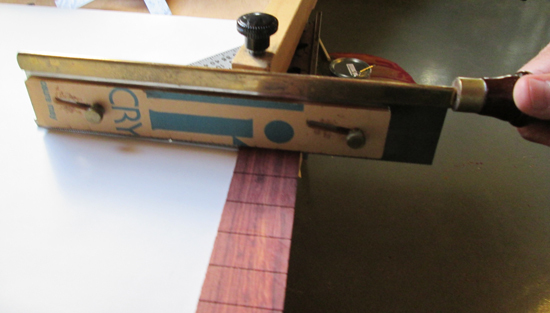 I use the Ibex fret rule for marking out the fret spacing. It is possible to use the fingerboard of a currently playing instrument to mark the fret spacing. Bear in mind the marks must be VERY precise. The fingerboard needs to have a straight edge so that a carpenter’s square can be used to layout the lines across the fingerboard. Check the edge of the fingerboard material, true it up with the jointer if necessary. I use a clamping arrangement on a table with a carpenter’s square to help me keep the slots in the right place. A fret saw that has a stop is recommended to prevent sawing the slots too deep. It is of great importance that the fret slots be of the correct width to hold the tang of the fret wire, a saw designed for fret work helps with this too. It would be a shame to lose a whole fingerboard over one small mis-cut slot. If it happens that a fret turns out to be a little off after the banjo is strung up for the first time, the slot can be filled with a dust/epoxy mixture and re-cut. Save some of the dust that results from cutting slots. If the dust is not used here it can be used with inlay work. 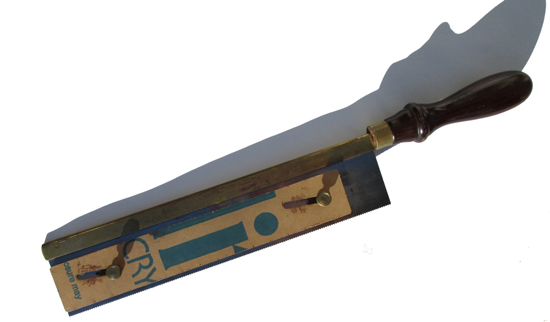 A fret saw with an adjustable acrylic stop helps control the depth of fret slots. 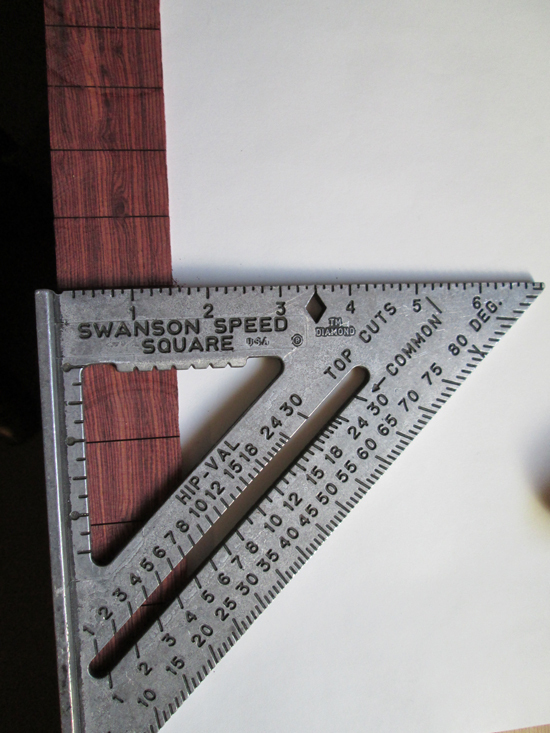 A carpenter’s square can be used to assist in cutting fret slots. Clamping the square and fingerboard to the edge of a table keep them from moving while sawing. Put the saw against the edge of the square to cut a slot right on the mark. In the case that you choose to go fretless there is no need to bother with thinking about fretting, it is fine to leave the fretboard as it is. Some fretless banjos feature a brass plate that covers the first to fifth or seventh fret area on the fingerboard. It is a nice touch and I feel it makes playing a little easier for steel string fretless banjos. For nylon strings I prefer to have only the wood of the fingerboard. It is easy to add a brass plate to the fingerboard. Use thin brass plate. A hobby shop or a store that carries supplies for architectural models may have some. Cut out the brass to roughly the shape that you desire. Make sure the end that will meet the nut is straight. It is okay for the brass to be a little wider than the fingerboard. If you want to add any decorative shape to the end of the plate nearest the bridge you should do it before fixing it to the fretboard. I rough up the mating sides of the fingerboard and the plate with some 150 grit sandpaper. Then I attach the plate using epoxy and cauls. After the epoxy is dry you can file down the edges of the plate to the exact dimensions of the fingerboard. This operation is best done after the fingerboard is glued to the neck. Gluing on the fingerboard is much like gluing on the peghead overlay, only bigger. Before gluing make sure that the mating surfaces of the underside of the fingerboard and the face of the neck are clean, true, and as free from chips as possible. Take care to align the fingerboard properly with the peghead overlay leaving a lot for the nut to sit in if you choose.